There’s an old saying that war is God’s way of teaching geography to Americans. These days, even that may not be enough. I was rooting for Johnson to get into the debates. I was hoping he would be there to present a sober and compelling case against the neocon agenda. Combining military belligerence with thoughtless adventurism should never again be America’s default international problem-solving strategy. That argument needs to be made convincingly… both to the American people, and to the other candidates on that stage. I appreciate Johnson’s skepticism about the utility of our military involvements. But making foreign policy needs more than gut instinct. It takes discipline to calculate and advance American interests. The better we can articulate the world, the better we can navigate it and weather its storms. By not doing his homework, Johnson squandered a huge opportunity. He had a chance to present an informed and thoughtful argument against interventionism that all Americans need to hear. He missed it. To be clear, I voted for Bernie Sanders during the primaries, and my vote will go to Clinton in order to stop Trump. I’m also appalled that Johnson favors private prisons and opposes the minimum wage. But my opposition to regime-change interventionism is so strong that I’d probably put him ahead of Clinton if we could rank our choices when we vote. But we can’t. The best we can hope for is that people who can offer good sense on an issue make full use of their powers to do so when given the chance. So, if Gary Johnson ever wakes up from this bad dream and gets another open shot at the question, here’s the kind of answer that I think would better serve the American people. Mike Barnicle: What would you do if you were elected about Aleppo? Gary Johnson: That’s a question that needs to be considered at length, because injustice and instability within Syria spreads beyond Syria. The civil war has resulted in over 400,000 dead and displaced millions of people. The humanitarian crisis triggers a refugee crisis which triggers an immigration crisis which triggers a resource crisis. And that triggers the rise of xenophobia and racism in the West. At the same time, huge ungoverned swaths of Syria have become like a Mad Max crucible for terrorism. Right now, the Obama Administration is making the correct move. They should keep looking for ways to work more closely with the Russian government. The immediate goal should be to broker a cease fire that can alleviate suffering in Aleppo and other besieged cities. That will open the way to a long-term political solution. But overall, the Administration’s policy has been counterproductive. They don’t understand what America should NOT do. We shouldn’t be joining the circular firing squad called the Syrian civil war. We certainly shouldn’t be imposing a no fly zone there, as Hillary Clinton called for. The American people need to keep in mind that ISIS and Al Qaeda don’t have planes. It was a mistake for the President to demand “Assad must go.” Even if we personally wish for that outcome, that’s not a proper commitment for US policy. Those us of who opposed the Iraq War before it started should keep saying “We told you so.” The American people have to learn to recognize the wrong turns of history. We need to identify mistakes. Because, if we ignore them we’ll keep repeating them, and then we’re doomed to a hellish world of unintended consequences. That means we need to admit, loud and clear, that the regime-change road-show was a flop. That doesn’t mean we should simply turn away from the crisis. We’re not isolationists. The United States still has obligations under the international doctrine of “Responsibility to Protect.” So, once we make it plain that our involvement in humanitarian interventions is not a pretext for regime change, we’ll be in a better position to accelerate our work with Russia to bring about a resolution. Willie Geist: So an alliance with Russia is the solution to Syria. Do you think Vladimir Putin in Russia is a good and reliable partner? 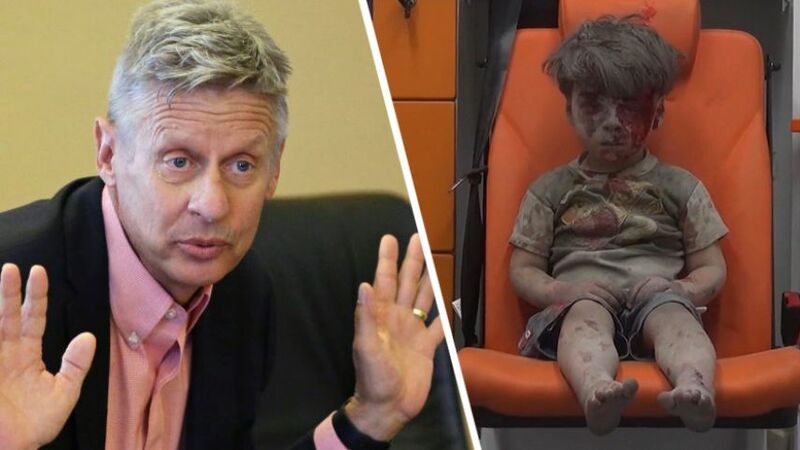 Gary Johnson: The ultimate solution to Syria can’t be imposed from the outside. It has to come from the inside. The Russians can help a lot, and it’s certainly in their interest to do so. They’re at least as vulnerable to terrorism from that region than we are, and they know it. The success of any partnerships between the US and Russia will hinge upon advancing our mutual interests. Of which there are many. Once we get over our Cold War baggage, we could be very formidable partners. But we also have to be frank with them. Overall so far, Russia’s behavior in Syria has been far more counterproductive than ours. Assad is their client. He’s killed 360,000 of his own people. Historical trial and error offers some lessons that are valid for Syrians, for Russians, and for Americans. When you make it your business to deny people the right to pursue their own sovereign aspirations, you’re going to make enemies a lot faster than you can conquer or kill them. You’ll never get real security that way. The long-term solution to this crisis depends on people waking up to their own best interests in security, prosperity, and respectability. Enabling the murder of 360,000 people does not get you any of that. For more background on Syria. Skip the long introduction and go to Juan Cole’s presentation which starts at 8:45.